brochure. 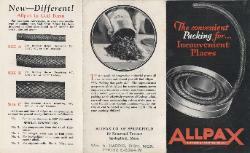 This brochure features Allpax Packing (No. rank wherever packing is used." product catalog for Allpax. It is a 6 page brochure.